HIGH Stringing together a complex puzzle using simple geometry. LOW No controller support in handheld mode. WTF Why can’t I use the controller in handheld mode!? I’ve had the Switch since it launched and spent hundreds of hours playing the hybrid system, but probably less than ten percent of that time hooked up to a television in docked mode. Handheld mode is my preference – it’s convenient and allows me to play videogames while others are using the television. Controls have never been an issue for me before, but that all changed with Solar Flux. Solar Flux has beautifully rendered spacescapes filled with stars, asteroids, and even black holes. The music is soothing, and puts players at ease as they try to solve its puzzles. The story is never really explained, but the premise is interesting – stars are dying, so the Solar Galaxy Federation sends out spaceships to collect energy that will recharge the dying stars. The gameplay isn’t too complicated, and small tutorials at the beginning explain the basics. From a bird’s-eye view, players need to launch spaceships towards floating orbs of energy. 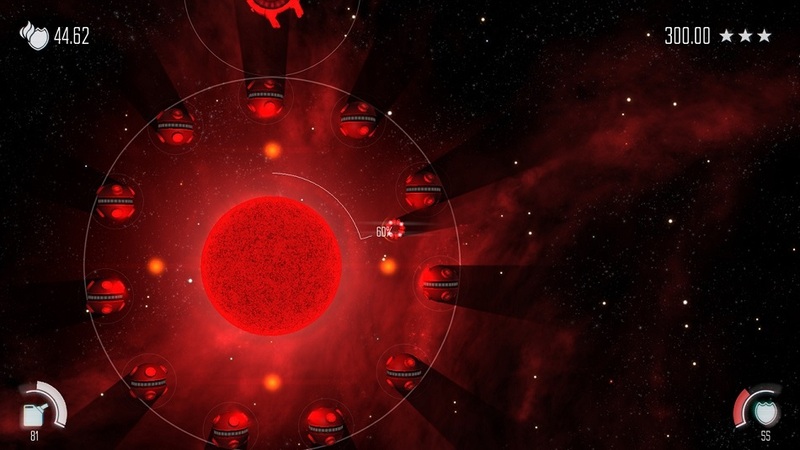 Upon collecting the energy, players then shoot it into the dying star by tapping on the star. Each star has a percentage of energy it needs to regain, which usually corresponds with the amount of energy floating in space. While doing this, players must also contend with things such as planetary bodies, space mines, and even meteors. 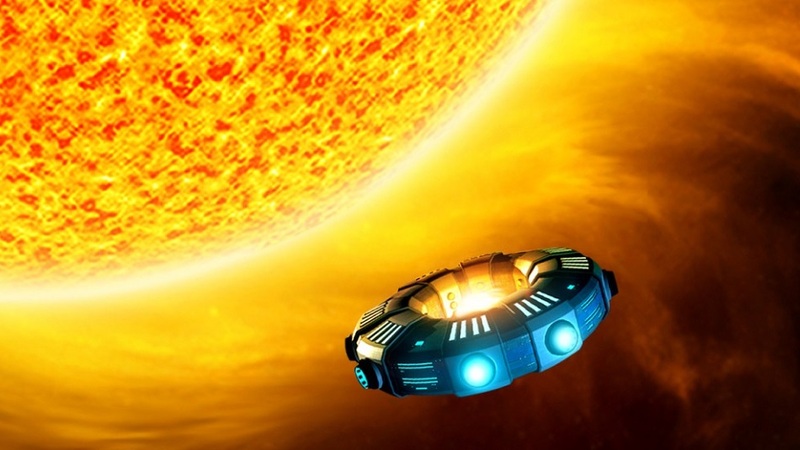 Mini-planets allow the spaceship to orbit without using its limited amount of fuel. They also block out sunlight, which allows the spaceship to recharge its solar shield (though I’m not sure why these sun-saving ships have such weak protection…) The space mines can create orbital paths for spaceships, but must be used sparingly as they have a short fuse and will take an orbiting spacecraft down with it. 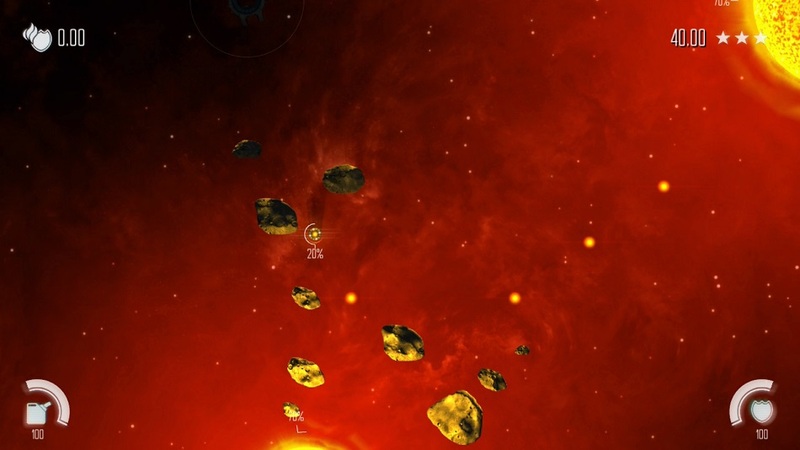 Meteors destroy the spaceship, and can also take out planets and energy orbs, preventing players from having enough to save a star. Between the gameplay premise and these elements, there’s enough variety to keep things fresh throughout the four main galaxies. This is all fine enough, but there’s one major problem — the controls. 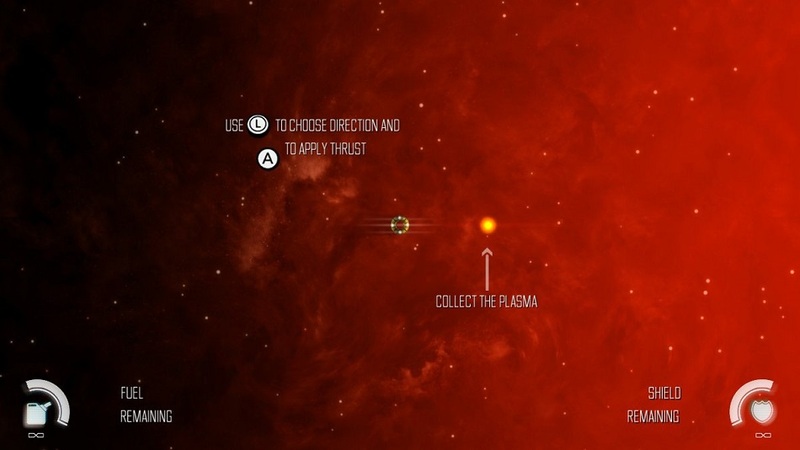 Playing in handheld mode, Solar Flux is a completely touchscreen experience, and the spaceship’s thruster is controlled by tapping on the opposite side of the craft. This worked well when I wanted the craft to go left and right, or even to the top of the screen. However, when I needed my spaceship to travel towards the bottom of the screen, things got complicated. I needed to tap the top of the screen, but often, this meant my entire hand was obstructing my view, resulting in my spaceship careening into a dying star or large asteroid and ending the mission. Trying to reach a far-off planet or simply avoiding obstacles was also complicated by the controls. I never felt like I could aim precisely or escape a ticking space-mine quickly enough. Also, many stages appear to have one ‘quick’ route for collecting the energy and saving the stars — I could often see that path, but the touchscreen hampered the speed in which I could complete it. I kept thinking how much better the experience would be if I could just use my joystick for slight trajectory adjustments or with lightly pressing a face button to add boost to my ship. After all this frustration I plugged my Switch into the dock and discovered that Solar Flux does offer controller support! Aiming and thrusting are more precise and less frustrating when using controllers, and I was able to quickly complete stages I had failed numerous times in handheld mode. Why isn’t the controller an option in handheld mode!? Yes, the Switch has a solid touchscreen, but it handles controls so much better with a joystick and buttons. Not even providing the option to use the joycons in handheld is an unfortunate omission. Disclosures: This game is developed by and published by Firebrand Games. It is currently available on Nintendo Switch, Steam, iOS and Android devices. This copy of the game was obtained via publisher and reviewed on the Switch. Approximately 4 hours of play were devoted to the single-player mode, and the game was not completed. There are no multiplayer modes. Parents: According to the ESRB, this game is rated E for Everyone. Parents should have no worries here. Failure of a mission results in the spaceship blowing up, but that’s about it. Deaf & Hard of Hearing Gamers: All info is delivered via text on the screen. Text size is not adjustable. There are no sound cues within the game. This game is fully accessible. Remappable Controls: No, this game’s controls are not remappable. The game controls differently in TV and handheld modes. When the Switch is connected to the TV, players use the controller. When it is in handheld mode, players must use the touchscreen, controllers are disabled. 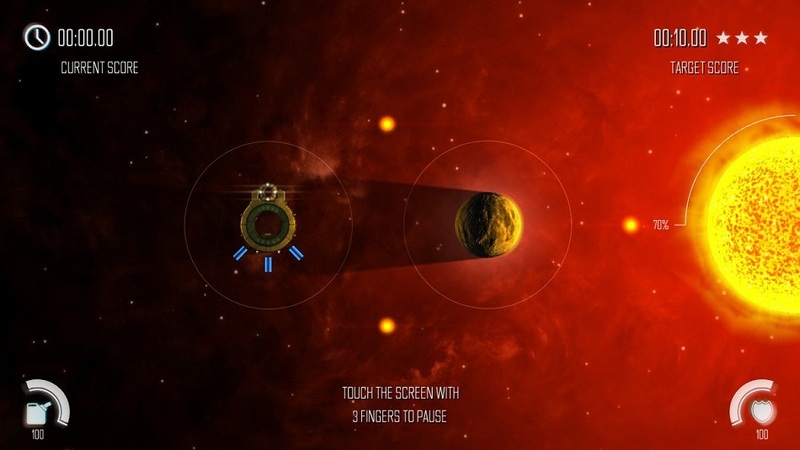 Touching the screen will boost the spaceship in the opposite direction. Touching the star fires the collected energy from the spaceship. Two finger pinching is supposed to zoom in and out on the stage map, but I never once was able to achieve this.